Today, 6 July, is National Fried Chicken Day (seriously who came up with these days?) so I’m back here with another history lesson on this delicious dish! 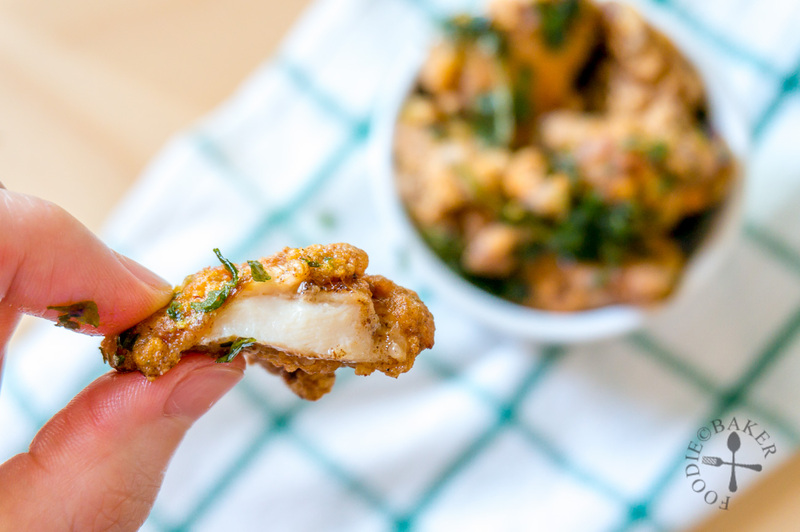 There are many different styles of frying chicken today – and in honour of this National Fried Chicken Day, I’m sharing a popular street snack from Taiwan – Salt and Pepper Popcorn Chicken! Salt and Pepper Popcorn Chicken, also known as 椒盐鸡块 (jiao yan ji kuai), 咸酥鸡 (xian su ji), or 盐酥鸡 (yan su ji) in Chinese is a popular street snack in Taiwan. Small pieces of chicken, usually chicken thigh, are marinated in a mixture of soy sauce, garlic and ginger and a spice called five spice powder (五香粉). Five spice powder is a spice mix consisting of star anise 八角 (ba jiao), cloves 丁香 (ding xiang), cinnamon 肉桂 (rou gui), Sichuan pepper 花椒 (hua jiao) and fennel seeds 小茴香 (xiao hui xiang). It is used very commonly in Asian cuisine as a spice rub like for Roasted Pork Belly 烧肉, in stews or braises such as Char Siew 叉烧 or Lu Rou Fan 滷肉饭, or in a marinade like these popcorn chicken. 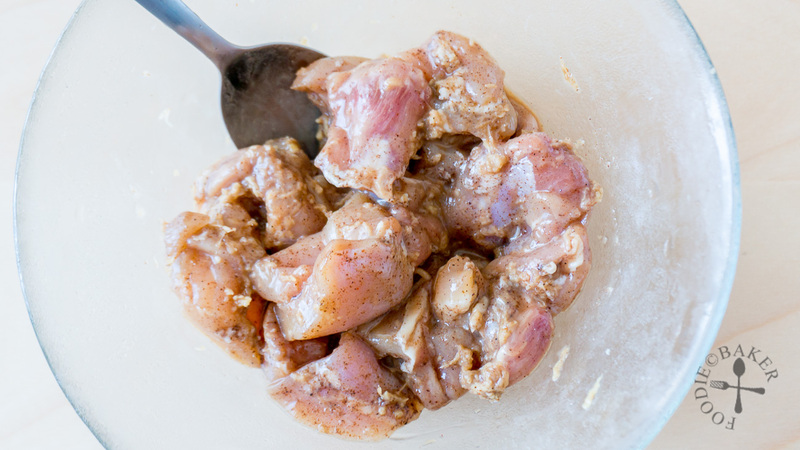 Only step-by-step photo today: marinated chicken pieces ready to be deep-fried! 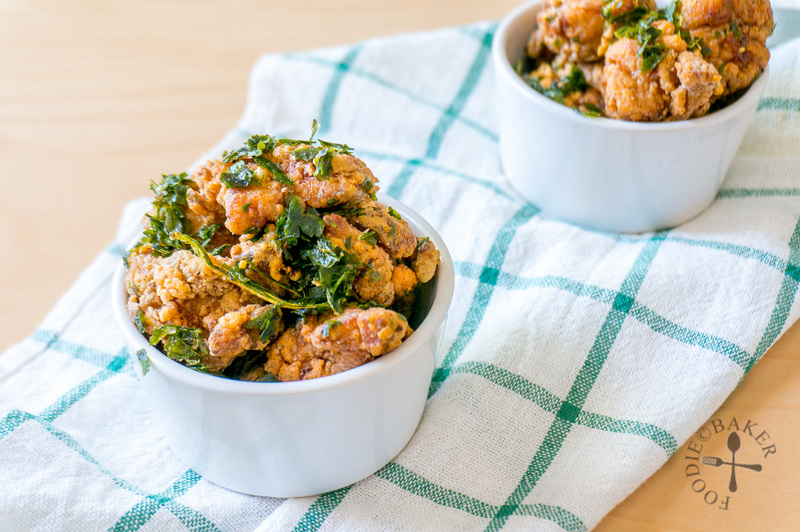 Making these Salt and Pepper Popcorn Chicken is not very difficult – just mix the chicken and the marinade overnight, dip them into potato or sweet potato starch (the starch is the key to a crispy exterior) and deep-fry to perfection. The difficulty perhaps lies in the frying of the chicken, and the question most people will have is, how to make the chicken crispy yet not greasy? My answer: double-fry them! Ever since I learned how to double-fry, I’ve never looked back – the first fry is to cook the meat while the second fry is to expel any excess oil and to make the meat nice, crisp and golden but not greasy. Once you have a few experiences of deep-frying, you will get the hang of it and it’s definitely not as scary and difficult as it seems. 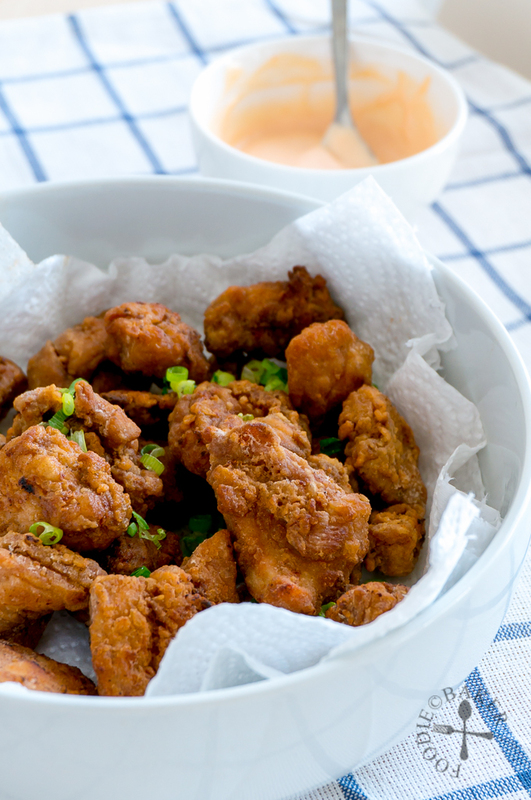 These Salt and Pepper Popcorn Chicken can be enjoyed on their own – it’s so nice to snack on them while watching a show. Or, they can be wrapped up by a tortilla with some mayonnaise, chilli sauce and finely shredded lettuce as a meal. Either way they are incredibly delicious! And if you are yearning for more fried chicken, check out my Japanese Fried Chicken (Chicken Karaage)! 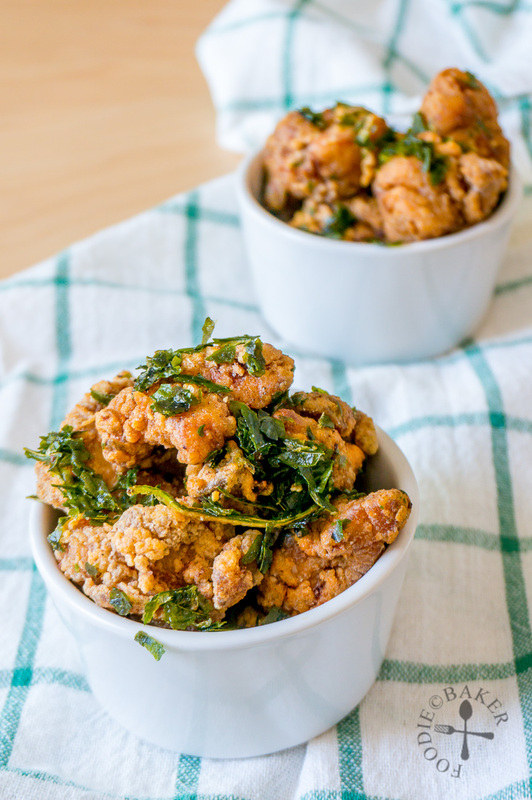 And here’s the recipe for these delicious, crispy and addictive Salt and Pepper Popcorn Chicken! Rinse and pat dry chicken thigh with paper towels. Trim off excess fats then cut the chicken thigh into 1-inch pieces. Place into a small mixing bowl and add in Marinade ingredients (garlic, ginger, light soy sauce, mirin, cornstarch/potato starch, five spice powder, ground white pepper and cayenne powder). Coat the chicken pieces well with the marinade. Cover the bowl with plastic wrap and refrigerate overnight. Heat 1-inch deep of oil in a pot over medium heat. (I used a small 1-litre pot so I don't have to use so much oil.) Insert a dry wooden chopstick or the handle of a dry wooden spoon in the oil - when the oil bubbles steadily form around the chopstick or spoon, the oil is ready for frying. Coat the chicken pieces in potato starch and add into the oil. If your pot is small like mine, fry the chicken in 2 batches. Cook over medium heat, stirring the chicken occasionally to prevent them from sticking together, for 3 to 5 minutes until cooked through. Remove with a slotted spoon and drain off excess oil in a sieve / colander / rack. Repeat until all the chicken is cooked through. Turn the heat up to high and heat the oil for 30 seconds to 1 minute (not smoking hot, if the oil smokes, remove from heat and cool slightly before using). Add all the cooked chicken pieces back into the pot and fry over high heat until the exterior is crisp and golden-brown in colour, about 1 minute. Remove with a slotted spoon and drain off excess oil on paper towels. Turn the heat down to medium. Add in basil leaves (be careful they will sputter so stand back or cover with a splatter guard) and fry until crisp, about 30 seconds to 1 minute. Remove with a slotted spoon and drain off excess oil on paper towels. Transfer the still-hot chicken into a mixing bowl and season with salt (do so sparingly), white pepper and cayenne pepper, if using. 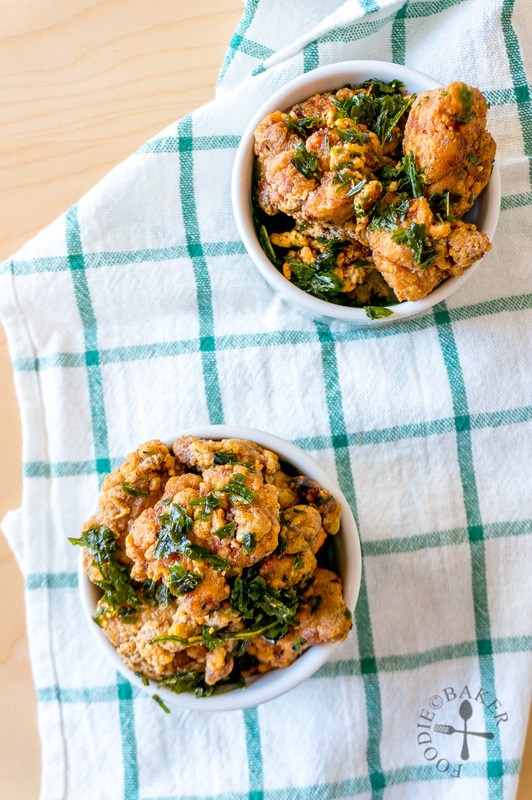 Toss in the crispy basil leaves and serve immediately. - The basil leaves will sputter so it's best not to wash them (I learned this the hard way). If you wash them, make sure they dry thoroughly with many paper towels before frying. If you don't want to go through the trouble, just thinly slice the fresh basil leaves (ribbon) and toss with the cooked fried chicken. My mouth is watering! I think my hubby would be in heaven eating these 🙂 I need to make some soon! Wow this sounds delicious and looks so good!! I must try this recipe.